NVIDIA SLI and ATI CrossFire have been around for quite a while now, but it's only lately that the industry has seen a significant breakthrough and advancement in the technology. If you don't know what these 3D performance enhancing technologies do exactly, I'm sure you've at least heard of SLI and CrossFire before. In this article we will explain what SLI is and how it works, and you can read our other article on ATI CrossFire if you want to know about that too. Back in 1998, the company 3DFX first introduced us to the SLI term with their Scan-Line Interleave technology used in their Voodoo2 range of graphics cards. NVIDIA then came along and bought 3DFX, and came up with a new idea of using the PCI-Express bus to increase 3D graphics performance. They named this new technology Scalable Link Interface (SLI). NVIDIA SLI basically works like a dual core processor, it splits the load into two. With SLI you have two or more video cards connected together in a master/slave setup via what's called an SLI bridge. When displaying 3D graphics on the screen, all the work is divided into smaller parts and sent to each of the GPUs for faster processing. When the slave GPU is done processing, it sends its output to the master GPU via the SLI bridge, and the master GPU combines everything to display the images to the monitor. What Do I Need For SLI? To use NVIDIA SLI in your gaming computer you must have a motherboard based on a NVIDIA chipset and you need at least two PCI-Express 16x slots. You also need two (or more) NVIDIA video cards that are SLI compatible. You must keep in mind that the two or more video cards must have the same GPU (and preferably have the same memory and clock speed too), although they may be of different manufacturers. If you're buying a brand new card you can be sure that it is SLI capable, but if it's a slightly older card you must be sure it can be used with SLI because not all of them can. So double check before buying a video card. 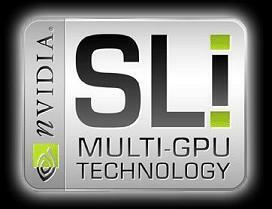 NVIDIA SLI technology can be set to function in different modes. Split Frame Rendering (SFR) - This mode works by cutting each frame in half and sending it to each GPU for processing. Very simple. Alternate Frame Rendering (AFR) - Instead of breaking a frame into smaller pieces like SFR, AFR works by each GPU rendering a whole frame one at a time, one after the other. SLI Antialiasing(AA) - With just a single video card, you can enable antialiasing up to 4x. But with an SLI setup and multiple video cards, you can experience much more antialiasing such as 8x, 16x, 32x, and even 64x with a quad SLI system (4 video cards). Quad SLI is just what the name implies, four GPUs working together for amazing performance. It can be accomplished by either having 4 video cards slotted into 4 PCI-Express 16x slots, or 2 dual-GPU video cards slotted into 2 PCI-Express 16x slots. As you can imagine, this will increase performance in your games. You will see the true power of quad SLI when you're in high resolutions, and when you enable SLI Antialiasing mode.